Kettering Town manager from Jan 1958 to May 1961. Whilst the previous manager’s tenure had been short-lived and a little unfortunate (especially in respect to having to follow the hugely successful Tommy Lawton), Mather did sign several of the key players that his successor Jack Froggatt inherited and of course also signed Froggatt himself two months prior to the ex-England player taking over. Froggatt’s first game solely in charge of Kettering was a home fixture against Yeovil Town on January 18th 1958 and the newly-appointed player-manager wasted no time in reshaping the team’s fortunes as the Poppies promptly thumped their visitors 6-0. The much-improved performances continued under Froggatt and by the end of the season Kettering had lost just three more league matches and finished a fairly respectable eighth in the Southern League table, with Bill Draper (a Mather signing incidentally) notching 33 of the club’s 99 league goals. The summer of 1958 saw the addition of a running track around the Rockingham Road pitch to allow the players to improve their fitness levels during training under the watchful eyes of player-manager Jack Froggatt. At this point it would probably be useful to recall that the installation of floodlights at Kettering Town’s ground were still several seasons away. The new season started well for Jack Froggatt and his players, with the FA Cup victories and goals starting to pile up as Kettering slowly worked their way through from their early entry at the 1st Qualifying Round stage. A 6-4 victory at Spalding Utd was swiftly followed by a 5-1 hammering of near-neighbours Corby Town at Rockingham Road and subsequent away victories, 1-0 at Rushden Town and 3-1 at Oswestry, saw the Poppies come up against arch-rivals Peterborough Utd in the 1st Round proper. At the time, Peterborough Utd were playing in the Midland League and had been trying to break into the Football League for the last two decades. Southern League Kettering Town traveled to London Road as the underdogs, but were determined to show their more illustrious neighbours they meant business. 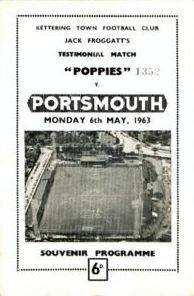 Although not really necessary, extra tension was added to the buildup of the tie by the war or words between the two sides, with the Posh programme notes reacting to a preceived slight by Poppies boss Jack Froggatt, after Froggatt had commented that although Peterborough were undoubtably a good side, they had no real competition in the Midland League. A crowd of 17,800 spectators at London Road witnessed an exciting 2-2 draw, Froggatt himself was missing from the Poppies lineup which took an early 1-0 lead, only for the home side to pull-back level and then take a 2-1 lead which they held until four minutes from the final whistle. Hughie Morrow’s through ball found Bill Draper who slotted the ball past Posh Keeper Jack Walls and Kettering had earned a replay. The following Thursday afternoon (remember no floodlights back then), saw a packed Rockingham Road crowd of 11,246 (only 280 less than the record set in 1947) and Froggatt was back in for the Poppies, but full-back Maurice Marston was unavailable and his place was taken by former Peterborough player Brian Reynolds. Kettering took a two-goal lead in the cup-tie with Bill draper heading both goals, but Peterborough fought back and reduced the deficit on 71 minutes through Denis Emery. Kettering continued to battle and looked set to go through until 5 minutes from the end when Brian Reynolds tried to head clear, only for the ball to rocket past his own keeper and gift Peterborough a reprieve with extra-time. The inevitable duly happened and with nine minutes of extra-time left Billy Hails put Peterborough through to end Kettering’s gallant cup heroics for another season. At the end of the 1958-59 season, Kettering finished runner’s up to Hereford Utd in the Southern League North – Western Zone and duly qualified as founder members of the Premier Division of the Southern league. The promotion didn’t last long however, as the Poppies finished bottom and were relegated to the Southern league First Division for the start of the 1960-61 season. Kettering’s fortunes improved remarkably and a long cup run eventually ended in a 4-2 defeat away to Reading in the 2nd Round in front of a crowd of 12,477 with the Poppies’ goals scored by Walden and Morrow. It’s also interesting to note the attendances during that cup run totaled 38,218, which over the seven ties was an average crowd of 5,460. The league campaign also proved to be a successful draw and with two matches left, league leaders Kettering managed a controversial 2-2 draw at home to Poole before hosting second-placed Cambridge Utd in the final match of the season. A draw would have been enough for the Poppies but they finished in style, running out comfortable 3-0 winners. Ironically, Wally Akers came into Rockingham Road to take over as manager at the start of the 1961-62 season but Froggatt stayed on at Rockingham Road to continue his playing career with the Poppies for another two seasons, before finally retiring in May 1963. When Froggatt retired from football he returned to Portsmouth and started a career in the licensed trade, which lasted 22 years. Jack suddenly passed away, aged 71, in February 1993. The former England and Portsmouth legend will always be remembered at Kettering for his uncompromising and inspirational style of leadership, playing at centre-half, his sleeves rolled-up, always in the thick of things and giving his all for the club.